Syria Solidarity UK: What has the Syrian Freedom Charter to offer that the 1973 Syrian Constitution did not? What has the Syrian Freedom Charter to offer that the 1973 Syrian Constitution did not? 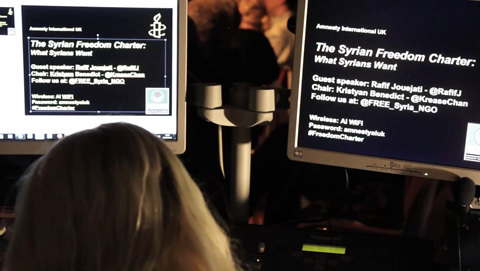 Amnesty hosted a presentation on the Freedom Charter in May. Watch the video here. Dr Hanadi Ismail is a consultant and researcher in sociolinguistics and forensic linguistics. As a Syrian, who has believed in the spirit of the revolution, its cause, and the victims who paid their lives for justice, I do not feel that SFC represents me. I read the Syrian Freedom Charter (SFC), looked closely at the survey questions on which the Charter is based, and finally looked at the charts that show the results. I do not feel that it addresses the issues and aspirations of modern Syrians, or rather more accurately phrased Syrians today. By ‘Syrians today’, I do not only refer to the Syrian youth, but also to all Syrians of different backgrounds whose lives have changed as a result of exposure to the social and political changes in the country over the past four decades. Article 25 and 27: both guarantee the Syrian people’s right to freedom of expression, the rule of the law and equal opportunities. Articles 38 and 39: both specify the Syrian people’s rights to freedom of expression in all media of expression, in addition to their right to assembly and peaceful protests. Article 28: bans detention, criminalises torture, guarantees the Syrian people’s right to litigation and the independence of the judicial system. Article 35: guarantees freedom of belief, and religious practice. Article 37: free education as a right to all Syrians. Article 45: guarantees the rights of women to equal opportunities, contribution to all aspects of life and their right to remove restrictions that hinder their development. Article 11: specifies the Armed forces’ responsibility in defending the country and its borders. Article 14: provides for the people’s ownership of public wealth and public institutions. Significantly and most urgently, the SFC overlooks important components of the Syrian society such as the youth and the less privileged, who had led the revolution and whose areas of residence continue to be the areas where rebel groups operate from. They are the displaced refugees in Lebanon, Turkey, Jordan and Iraq, in addition to those of them who are displaced within Syria. The aspirations of these groups cannot be bluntly summarised in a ‘copy and paste’ style of demands as these appear in the current SFC. A valid and legitimate Syrian Freedom Charter will address the specific issues of these groups, including tailored development programmes that enable them to be part of the process of building the future of Syria. Today, and in fact for the past year, Syrians are faced with a serious and pressing issue that is not only hindering any change but is also overburdening their future aspirations: the rise and threat of IS and other fundamentalist groups. My question here is why does the survey completely and utterly overlook exploring the Syrian people’s opinion on this? 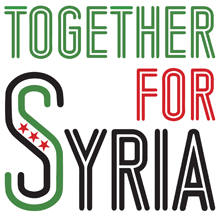 Why are Syrian people not asked in the yes/no style of SFC survey about their worries, hopes or thoughts on the future of Syria and their own lives given the rise of these groups? If the survey’s aim is to avoid any tensions, so to speak, then this is not representative or objective. Today, we have an additional enemy in Syria, which we simply cannot continue to overlook under the pretext of not wanting to derail the main cause of the revolution: getting rid of Bashar al-Assad’s regime. As a Syrian who is familiar with the Syrian Constitution, lived in Syria and understand the ‘nitty gritty’ of rules on paper and rules in practice, my question for you is, how can you convince me that your SFC, similar at it is to the 1973 Syrian Constitution, will provide me with anything different? With appreciation to the fact that the FSC provides for freedom of belief and religious practice, and equality in opportunity for different groups and religions, why does the SFC refrain from directly stating that its framework is civil and secular, or at least from exploring people’s opinions on this? As a woman I would expect from a revolutionary charter of freedom to offer me equality before the Law in all aspect of life and civil matters. More specifically, matters related to divorce rights for women, including financial matters and custody, in addition to equality before the Law in other civil matters related to inheritance among many others things. 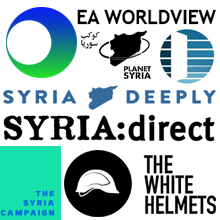 This is my personal view, and I respect that others may have different views on this matter, but as a potential participant in the SFC, and as a Syrian who believed in the spirit of the revolution and its cause, I believe I should be asked about this in a democratic style of charter that is presumably representative of people’s aspirations. My last point is rather ‘technical’. It concerns the design of the survey. As a researcher and higher degree holder who is trained in designing questionnaires, and collecting and analysing data, I find the survey rather poorly designed and analysed. First of all, the survey questions are the actual components of the SFC. In other words, the results or the demands of SFC are not deduced from the survey, they are the actual survey. Furthermore, the design of the questions/demands is presented in a way which directly shapes results in one direction or the opposite. As an example I quote the following: “All Syrians are equal before the Law: agree/disagree”. Results show 97% in agreement. This is like asking the obvious. It is misleading and patronising – this is the Syrian Constitution. Results are further broken down in terms of age groups, gender and locations of participants. The remaining charts covering the rest of the questions, which are broken down in the same style, all show more or less symmetric results, namely in the range of 86%-97% agreement. This is a sharp division, well expected from a poorly designed questionnaire which is pretty much denotative – the results no doubt reflect this sharp indication. I appreciate all the effort put in preparing and finalising the SFC, however I do not believe that it is constructed as it stands in a way which looks to explore the aspiration of the Syrian people. It does not address any issue which is specific to the Syrian society and the Syrian revolution. Participants should not be limited to loaded ‘yes’ or ‘no’ questions that the survey presents, but given the chance to express their own visions, ideas and opinions for the future of Syria. The Charter needs to address the specific issues that pushed people to sacrifice their lives and rebel against the regime – social and political injustices, not as abruptly and vaguely stated in the 1973 Syrian Constitution. There need to be components which reflect the revolution- revolutionary Charter that reflects the ability of the revolution, if any, to face the new challenges today – the threat of fundamentalism and future of the new generations of Syria.